In this guide we’ll teach you the various considerations you’ll need to make when you’re still in the planning phase of your project. Primarily considerations around size, exposure, access, location and shape. You might also be considering additional design elements such as lights, stairs & balustrading – or even different types of framing styles. We’ve a whole host of decking ideas that you’ll love! Section 1: How Will You Use Your Decking? Before you plan the aesthetics & practicalities of your decking, it’s primarily important to consider their purpose. What will they be used for? The number one rule when designing decking for your home is to understand how you’re going to use the space, before you go ahead and get started. Browsing decking ideas can help inspire how you’d like your build to look. Figuring this out now will prevent any headaches once you’re mid-way through your build. Allow enough width & length in your decking to accommodate sun loungers or fully reclined seating during the summer months. If you’re planning on doing plenty of outdoor reading, it’s advisable to build your decking in a secluded area of the garden where noise & distractions will be at a minimum. Allow enough room for your desired table & chairs. 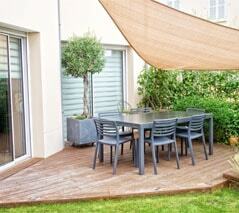 Position the decking as close to the kitchen as possible – helping to minimise the length of trips back & forth. 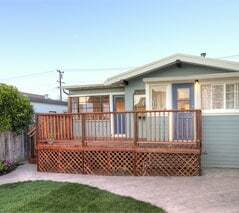 Consider additional space for a built in brick or gas barbeque. This is much easier to sort before you’ve began any construction work! With so many people likely to be using your decking, safety should be your main priority. It’s well worth including a hand-rail. If there are any sharp inclines or drops, consider stepping. Space for a barbeque or bar-top would likely go down very well with your guests! Make sure to leave plenty of space for seating & tables where guests can put their food & drinks. Wide open space is a must to allow guests to congregate. 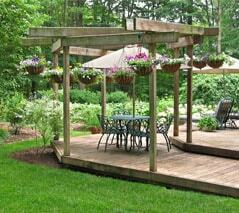 Consider a canopy for those rainy days or go one further & build a pergola. These look spectacular & also provide shade during warmer summer days. Our experts recommend that a minimum deck size of 14 x 28 ft is required for entertaining 10 – 12 guests. Hot tubs can be seriously heavy! If you’re planning on sitting yours on top of your decking, you must ensure that the footing, support & framing are built to handle the load. If you already have a hot-tub, you might be better sitting this on the ground & building your raised decking set around the Jacuzzi. Decking can be incredibly slippy – especially when you bring water into the mix. Grooved decking with non-slip paint or varnish is highly recommended for pool structures. Railings can work incredibly well as make-shift towel-holders! Leave plenty of room for pool access. Generally we’d recommend forming a perimeter area of at least half a meter around your pool which should be left completely clear. Of course, your decking can be used to accommodate all of these uses [& more!] – but it really helps to consider any primary purpose before your build. Plan each of these properly & you’ll be well on your way to the perfect build. The size of your decking is always going to be relative to the size of your garden which can often place limiting factors on your build, depending on the space available. A small garden needn’t mean you should compromise on your dream decking. It just means than the space you do have needs to be used economically. Utilising multiple levels within your decking that makes better use of the available space. If your garden is lacking width, position your decking boards left-to-right (across the width of your garden) to give the impression of a wider structure. Likewise, if your garden space is lacking in length, position boards from top to bottom to create the illusion of a longer garden space than might necessarily be the case. Specially designed garden mirrors help to give the impression of space where there might not be any – while wall-mounted flower pots can save space you might otherwise use. There are a number of garden seats out there which also double-up as storage space. These can be used to keep fold-out chairs, sports equipment & garden tools. Small gardens can be easily maintained (especially with the addition of decking) so this can often work in your favour longer term. Remember to be creative, use the space you do have intelligently & enjoy the process! The good news is that your build is less likely to be impacted by space – which is one of the most common limiting factors for new-build decking. Planning permission may be required from your local authorities. See our guide to Planning Permission to understand whether you’ll require this. With an abundance of space, it’s sometimes easy to get carried away with your build. Remember that the smartest designs use space at a premium & with intelligence. Regardless of your available space, the size of your deck design will likely be determined by the space you’ll need for the activities you have planned. Remember that no decking materials are completely maintenance free – and the level of maintenance you’ll need to carry out is completely dependent on the size of your decking structure. For a Simple, Relaxing Space: 2-3 people with sun loungers require at least 8 ft x 8 ft (64 ft²). For Dining: 5-6 people with an outdoor table & chairs will need a space of approx. 12 ft x 12 ft (144 ft²). For Social Gatherings: For a dinner party of 10-12 people, we’d recommend a minimum space of 12 ft x 26 ft (312 ft²). This same space could hold 25+ standing guests at a party or barbeque. Note that these are rough estimations & your requirements will depend on your personal needs. Top Tip: Deck plans can often look bigger than they are in real life. To make sure your plans match with the vision in your head, it’s advisable to transfer your plans into your garden before getting started with your build. Drive 4 stakes into the ground, matching them with the corners of your proposed decking & connect them with a string. Then place seating, tables & your other planned materials within the space. If everything doesn’t fit as you expected it to – go back to the drawing board. The beauty of decking is that it allows you to spend more time outdoors enjoying the elements. Whether your garden is north or south facing, the amount of sunlight your garden is likely to receive will depend more on the time of day/year & any high structures (including your house) which are likely to block the sun. However most gardens are likely to receive at least some sunlight – and knowing which parts of your garden trap the sunlight can help you decide where you’d like to place your decking. Top Tip: If you’re unsure which sections of your garden receive the most sunlight, you can test this at different times of the day. However you should also check the bushes & shrubbery in your garden – naturally the plants in your garden will gravitate towards sunlight. The sections of your garden which grow fastest are likely those which receive the most sunlight. During the intense summer months, a gazebo or a pergola can offer an ideal, attractive way in which to offer shade from the sun & guard against the occasional rainy day. If you already have large trees in your garden, consider how you might work your decking around these to help utilise their natural protection. Otherwise you can also plant some new trees – provided you don’t mind waiting a few years! You should also consider how you’re likely to be affected during windy days. 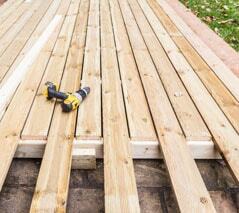 Placing your decking next to fencing can help block any sudden gusts of wind. Several retailers also offer wind-breaks which can be easily attached to your decking structures, or you could utilise trees or shrubs to break the wind. Top Tip: Exposure to insects should also factor into your plans. Often ants or wasps can find their way between cracks in the decking & build nests underneath the sub-frame. To keep them out, use treated wood, apply liquid pesticide & seal the wood – keeping it healthy so as to prevent insects finding access. If you live in a tropical climate, you might also want to use screening to help keep them out. You will also need to consider treatment of your structure to prevent corrosion as a result of exposure to the elements. We’ve covered this in further detail in our Maintenance & Aftercare section. During the design of your build it’s very important to consider how people are going to enter & exit your decking. For most people, their decking will act as a connection between the home & the garden – with plenty of nice-looking stops in-between. This is fairly straight-forward to accommodate & usually there will be an entrance from the back door or patio doors which lead out onto the decking. You might then have some steps which lead off the back of your structure, allowing easy access to the garden. If you’re planning on using your decking for dining & parties, you should also consider how easy it is to access from the kitchen. For more complicated structures, you might also consider introducing multiple access points. 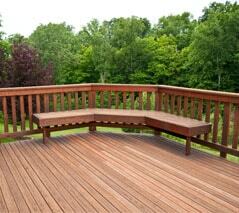 Perhaps one of the most important decisions you’ll make is where to put your decking. For most, their decking will connect to the house – potentially leading off of the living room, dining area or kitchen. 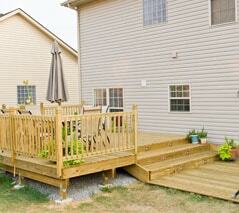 Decking can also be located away from the house, maybe next to a shed, pond or pool. It’s always advisable to consider the existing elements of your garden & how your decking can work with them – rather than having to cut down trees or lose valuable lawn space. Always make sure to know the location of any underground utilities before planning the location of your decking. People have been known to build decking over irrigation tanks, sewerage pipes or electrical lines & been forced to destroy everything when there’s an issue & they need to be dug up. Worse still – you don’t want to hit an electrical line during your build! Straight lines are crisp & tidy – they can really work cleanly as an extension of the straight lines of your home. Curved decking can really look sleek & can help your garden look ultra-modern. You must remember that while it may look attractive, rounded decking can add complexity to your build – primarily because decking materials are very straight & made of rigid materials. Decking handrails (also commonly known as balustrades) are useful for both aesthetic & practical purposes. For children & the elderly (who may be unstable underfoot) they are essential for safety on any high structures. If your decking is over 2ft in height, you will likely need balustrades to conform to UK Building Regulations. See our guide to this here for more information on this. A pergola is a structure which can be built onto your decking structure. It usually features 4 columns which support a roofing grid or rafters – and can be left open or closed with a roof. Pergolas can be especially useful if you live in a warm or wet climate as closed structures help to protect against the elements. Whether open or closed – they look great! 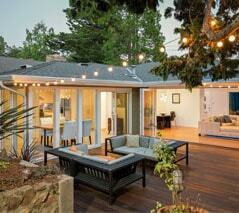 Decks are excellent for entertaining guests. However they will all need somewhere to sit! Most people will utilise portable chairs and tables which can look great – but for those who want to add something special to their structure; built-in seating can look fantastic & is incredibly practical. Built-in seating also frees up the storage space required for portable chairs. Lighting can add a real ‘wow’ factor to your structure & is especially useful if you plan on using your new decking during evenings. Floor Lights – many retailers offer lights which can be built into the decking boards themselves. Post Lights – available in a variety of styles. Solar-powered lights are also practical & eco-friendly – avoiding the need to wire-up your decking. Wall Lights – these are lights which are built into the wall above your decking & are often triggered by movement sensors. Whichever type you choose – lighting is highly recommended for visual appeal and can also help to make your home and garden a much safer place. The horizontal joists & beams which support the decking boards are often referred to as the frame or ‘sub-frame’. These are as important for function as the boards themselves – without a solid platform to rest your boards on, your deck won’t have any sort of stability or longevity. 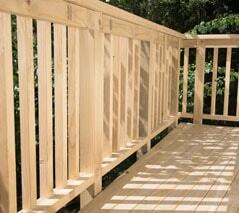 If you don’t do a good job with the sub-frame build, your deck could be rendered unsafe & spoil all of your hard work! The design & build of your decking base frame is vital – get this right & the remainder of your build should be fairly straight forward. Of course the sub-frame build requires a number of supplies & tools, but the first thing you’ll need to do in determining your requirements is understanding what type of sub-frame best suits your design & garden. Decking frames are usually built from pressure-treated softwood timber. This is usually because these materials are both affordable & durable. Even if the materials used above the frame are premium products, most will opt for pressure-treated timber underneath. With a low-level deck, sub-frames are raised slightly from the garden floor by deck support posts. This keeps joists & beams off the garden floor & away from any water which might accumulate underneath your deck. Deck support posts are usually placed into a footing which anchor the structure, while joists are attached to the beams with mini joist hangers. Probably the most popular of all the sub-frame types, patio-deck style decking will usually either be situated on a slope or feature a drainage system to ensure that any excess water drains away. The joists & beams will normally be positioned directly on the garden floor, which means they will need to be sufficiently treated & protected against moisture damage. The deck will also require a minimum of 2 support posts in footings that will anchor the structure in place. Some people choose to build their deck over the top of an old patio. During these builds, the timber frame will normally be constructed directly over the top of the old paving slabs. The decking frame beams are supported by the slabs using strong angle brackets or pressure-treated joists. It’s recommended that a protective plastic sheeting is used between the patio & the timber frame to prevent weed growth & exposure to moisture on the ground. Much like a low-level deck, an elevated decking frame is raised from the garden floor by support posts – keeping it from any accumulation of rainwater or frost on the ground. Structures vary but many will use lateral bracing of the beams to build upwards. Depending on the height of any structure, raised decks will usually need planning permission & will need to follow building regulations. An elevated design will complicate your build & it is highly recommended that you source professional experience to help with your build. Once you have fully considered & decided up on the size, exposure, access, location & shape of your decking, it’s time to put together some rough sketches of how it might look. Top Tip: Use graph paper for your designs. Each square can represent a given dimension (eg. 1 square = 1ft) allowing you to understand the scale of different elements. These don’t need to be architectural masterpieces – quite simply, at this stage you just need to understand the size, access, shape of your decking – as well as where it will be placed in your garden. Although sketching a deck is a fairly simple exercise, it’s sometimes very difficult to understand & visualise how it will actually look in your garden. It makes sense that you should spend plenty of time in your garden space while you draw up your plans to help overcome this. Getting a better understanding of measurements through this process will also help you to understand how much wood & labour will be required. From there you can then begin to estimate the potential cost of your build.